Create your own durable dinnerware! 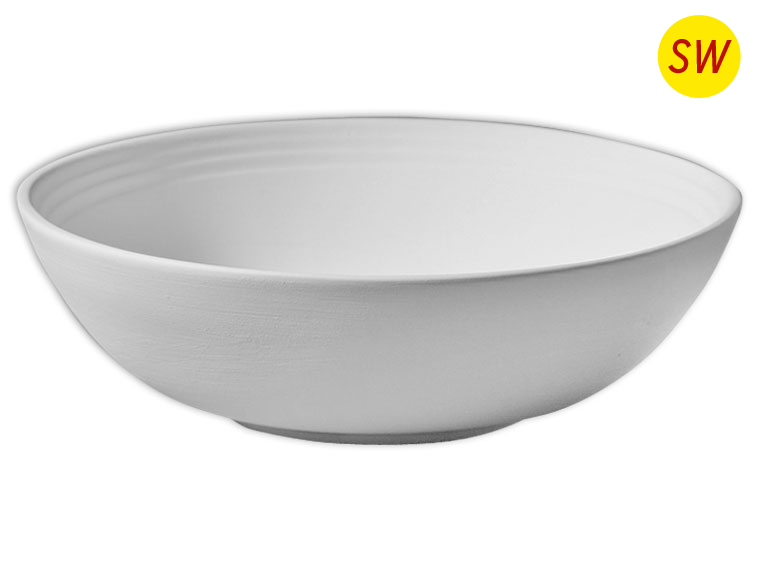 These Stoneware Bisque Rimmed Bowls are sure to be a hit in your studio! Stoneware Bisque is designed for use with cone 5-6 glazes. Stoneware bisque can be used in the microwave, dishwasher, and oven. NOTE STONEWARE FIRING: When firing we recommend a cone 5 or 6 program at medium speed. When loading your kiln place the bisque directly on a kiln shelf that has been coated with high fire kiln wash. Face handles of mugs toward the center of the kiln. Bisque should not extend past shelves as it could cause warping. Stoneware bisque needs to be fully supported during the firing process. Do not apply glaze to the bottom of stoneware bisque, these need to be dry footed. Do not stilt, as the stilt may imbed into the stoneware as it moves and softens during the firing process. It is always recommended to use witness/shelf cones during the firing to insure your kiln is obtaining the proper heat-work. NOTE STONEWARE USE: The benefit of using stoneware bisque is the durability and functionality; it is dinnerware, microwave, dishwasher, and oven friendly. For oven use we recommend that the ware be placed in a cold oven, warming as the oven pre-heats. Then stoneware can be removed from a hot oven, allowing to cool to room temperature. Avoid drastic fluctuations in temperature (freezer to oven, or oven to freezer) to prevent thermal shock within the clay body and glaze. Click here to view our Kiln Wash options. Click here to view our Stoneware Witness Cones. Check out our new Stoneware Glazes! Look for this symbol to spot our stoneware bisque. This product is manufactured by Mayco. Bisque Imports proudly manufactures and distributes a variety of products. For the most up to date product information, vendor news, and best practices, click here.